Cotton Kiwi: A little scrumptiousness! 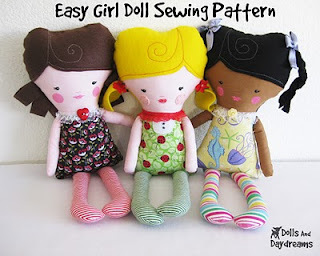 I've just ordered a pattern from Sarah of Dolls and Daydreams for her Dolly Daydreams dolls. I really love the look of these. Eloise loves them too so I know what to make for one of her Christmas gifts! As well as being an amazing crafter, Sarah is a very talented artist and I think that really comes out in the detail of these dolls. I can't wait to make some. I'm planning on making a couple extra for my stall too. You can buy your own pattern in her Etsy shop here. While you are there, check out her awesome printable eco-dolls houses.